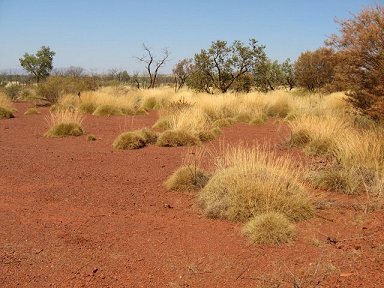 Justification: After no confirmed records since 1990, despite several dedicated searches and publicity campaigns, this species was rediscovered in 2005 in the Pilbara region of Western Australia. It may occur at low density elsewhere in its former range, because it is easily overlooked. It is likely to have declined as a result of a number of threats, and the remaining population may be tiny. For these reasons it is treated as Critically Endangered. BirdLife International 2007. Pezoporus occidentalis. In: IUCN 2007. 2007 IUCN Red List of Threatened Species. <www.iucnredlist.org>. Downloaded on 14 April 2008..
endemic to the continent of Australia. but most authors now prefer to place it within the genus Pezoporus together with the Ground Parrot. mottled with dark brown, blacks and yellows. was apparently a highly secretive species. 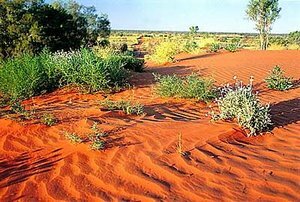 Australian interior; other early reports also indicate that it never strayed far from water. The population size of this species is currently a matter of debate. Estimates range from extinct to not threatened at all. It is, however, currently listed on the IUCN Red List as Critically Endangered. into a barbed wire fence in the Diamantina National Park in south western Queensland. flock of the birds in the far north of South Australia. checking the old nests of other birds, such as the Zebra Finch, for fragments of night parrot feathers. 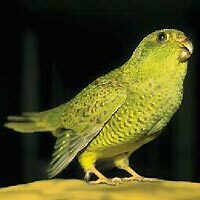 A sighting of two live Night Parrots in April 2005 has recently been confirmed by the Birds Australia Rarities Committee. These birds were seen near Minga Well, in the Pilbara region of Western Australia. The night parrot remains one of the most elusive and mysterious birds in the world of ornithology. and critically endangered night parrot (Geopsittacus occidentalis) is still present. as another has been given its last rites. The Australian has learned that National Parks and Wildlife Service officers have found a dead night parrot in the state's far west, confirming the survival of Australia's rarest bird. Diamantina Lakes region after it flew into a barbed-wire fence. while it does a survey to find more. by Australian Museum scientists was the first confirmed record of the species since 1912.
north of Coopers Creek, far northern South Australia, as part of an expedition led by Charles Sturt. occidentalis, based on a bird collected in 1854 near Mount Farmer, Western Australia. most productive known, with numerous sightings and another 20 specimens were collected. Museum, collected 16, all during this period. Following this period of abundance, there was a marked decline in confirmed sightings. They became rarer from the mid 1880s, stopping almost completely by 1900.
and the 1930s, the only specimen was one accidentally shot in Western Australia in 1912. Could need a few more pictures for illustrations...... Who wants to go for them down there in Australia?